Eigenstructure control involves modification of both the eigenvalues and eigenvectors of a system using feedback. Based on this key concept, algorithms are derived for the design of control systems using controller structures such as state feedback, output feedback, observer-based dynamic feedback, implicit and explicit modelfollowing, etc. The simple-to-use algorithms are well suited to evolve practical engineering solutions. The design of control laws for modern fly-by-wire high performance aircraft/rotorcraft offers some unique design challenges. The control laws have to provide a satisfactory interface between the pilot and the vehicle that results in good handling qualities (HQ) in precision control tasks. This book, through detailed aircraft and rotorcraft design examples, illustrates how to develop practical, robust flight control laws to meet these HQ requirements. 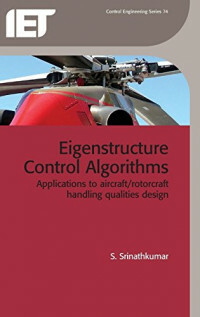 This book demonstrates that eigenstructure control theory can be easily adapted and infused into the aircraft industry's stringent design practices; therefore practicing flight control engineers will find it useful to explore the use of the new design concepts discussed. The book, being interdisciplinary in nature, encompassing control theory and flight dynamics, should be of interest to both control and aeronautical engineers. In particular, control researchers will find it interesting to explore an extension of the theory to new multivariable control problem formulations. Finally, the book should be of interest to graduate/doctoral students keen on learning a multivariable control technique that is useful in the design of practical control systems.